Murphy spoke to Israel-haters at the Women’s March. Does he regret that now? 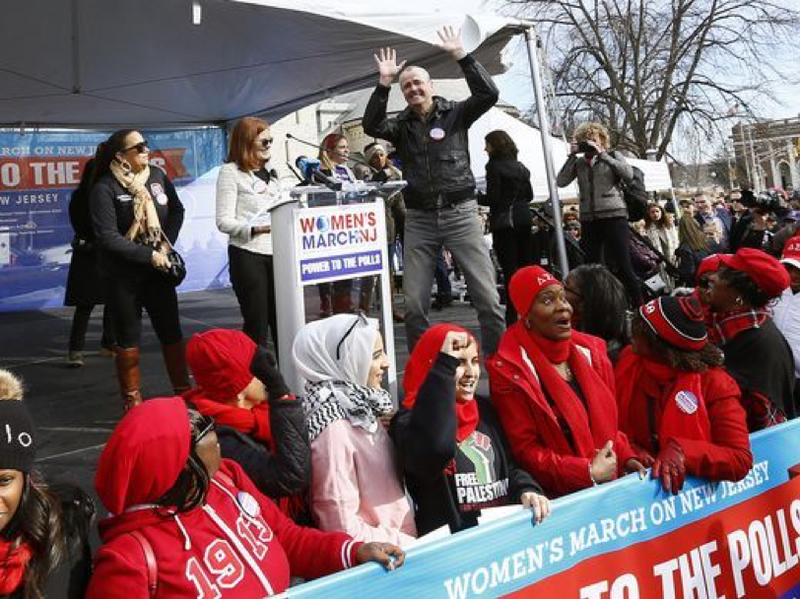 Earlier this year – while a young woman in his administration was trying to find justice after she claims she was raped by one of his top appointees – Democrat Governor Phil Murphy trotted on to the stage of the Women’s March in New Jersey. He apparently didn’t care that the group’s founder, Linda Sarsour, called for Jihad against the government of the United States or that she was a fan of Jew-hater Louis Farrakhan. He also didn’t seem to care that the Women’s March banner was being held by activists opposed to the Jewish State and that they were pushing anti-Israeli propaganda at the event – in front of him. Condemn it… he’s part of it. By allowing anti-Israeli propaganda to be part of the gatherings he speaks in front of, the Democrat is normalizing anti-Jewish sentiment by a major political party. Forget trying to link it to President Trump’s coarse plain-spokenness – this is direct. The people who would kill the Jewish State get to show up and be part of Democrat Party events and Murphy doesn’t say boo. At the vigil attended by Murphy, the Governor had the gall to speak against what he himself has done: "We must find the courage, even through tears and heartbreak, to reverse this trend. We cannot allow the normalization of hatred." Yes Governor, we agree, so stop! The Anti-Defamation League (ADL) said that anti-Semitic incidents had gone up by 32 percent in New Jersey. Of course they did. Hating the Jewish state is now mainstream with people like Governor Murphy, the Women’s March, and the Democrat Party. Over the summer, Murphy’s close political ally – U.S. Senator Cory Booker – played up to the Hamas/Hezbollah loving Israel-haters – the Antifa wing of the Democrat Party. After the Pittsburgh massacre, Booker had the gall to put out a press statement that triggered another Star-Ledger headline: Booker says 'words matter' following attacks against Democrats and Jewish worshippers. And then there’s Booker’s political ally – Democrat Lt. Governor Sheila Oliver – one of only three legislators to oppose a resolution that prohibited investment of state pension and annuity funds in anti-Jewish companies that boycott Israel or Israeli businesses. That’s right, Ms. Oliver – Phil Murphy’s running mate and Cory Booker’s political ally – the Lt. Governor of New Jersey, sided with those who hate the Jewish state. The Roll Call vote is below. Yes, words do matter Cory… and so do actions. S1923 Aa (1R) Prohibits investment of pension and annuity funds by State in companies that boycott Israel or Israeli businesses.